The last few weeks have been a struggle for me in more ways than one—physically, emotionally, and spiritually. The end of a year and the beginning of another has always been a time of reflection, and this season that reflection was not gentle for me. Looking back and looking forward felt the same, and I found it difficult to hold on consistently to what I know is true. For me 2012 was a year of self-focus. I guess that we all are self-focused more than we want to admit, but I definitely have been aware of my health and attitude every day since I discovered a lump in my neck on February 14 and had a cancer diagnosis on February 17. Every day of my 2012 life after February 17 began and ended with questions of how I felt and what I could and could not do. My world became smaller, and I had to remind myself constantly that I was safe in God’s hands no matter my circumstances. For the past few weeks I just haven’t felt well, and my symptoms made me wonder if something else was becoming a problem. A dear friend completed her treatment with the news that she is cancer-free, and I rejoiced. Although my tumors aren’t growing, my cancer is still here, however. Another friend told me that it took a full year after chemo before she felt like herself again. I go for chemotherapy every three weeks and continue my medications, and I will do so for at least another year and a half. Does that mean it may be almost three years before I feel like myself? Sometimes I think I can feel the tumors (which is not possible), but maybe that’s because I know they’re there. Perhaps you can see how by the end of the year I was feeling overwhelmed and fearful and, I admit, a bit lost. When I get like this, I find comfort in the reading the Psalms. No matter the crisis, the psalmist always comes to the conclusion that God alone is his comfort and strength. Through the years I have cried many tears with the psalmists and reached the same conclusion: my hope is in God alone because without Him there is no hope. With this new year, however, I’ve realized once again that while I can’t control my health, I can control my focus. I can trust that God’s plan for my life remains in operation, and having trust and faith is the counterbalance to feeling overwhelmed. I’ve spent time in the Word and with precious friends, brought some (just a little) order to my home and school life, and reflected on the grace of God. I’ve had some answers for the symptoms (nothing awful), have made intentional choices with my life, and have tried not to compare my experience with cancer to that of anyone else. The result is a greater sense of well-being and a diminishing awareness of my physical circumstances. It’s a better place. Gee, why does that conclusion once again surprise me? Aid means help of a practical nature, support in the achievement of something. Isn’t flourishing a lovely word? It means growth or development in a healthy, vigorous way as a result of a particularly favorable environment. I want to aid in the flourishing of my husband and my marriage, in the flourishing of my girls and my granddaughter Abigail. I want to aid in the flourishing of my mother and mother by marriage, in my brother and sister and my brother and sisters by marriage, and my family and family by marriage. I want to aid in the flourishing of my dear friends, who have been sisters of my heart, and in the flourishing of my colleagues, who are as dear to me as the closest of friends. I want to aid in the flourishing of my students and of the students whom I know but have not taught. I want to aid in the flourishing of my school, whose mission is “…to nurture and challenge the whole person—body, mind, and spirit—to the glory of God,” and of my school and church community. 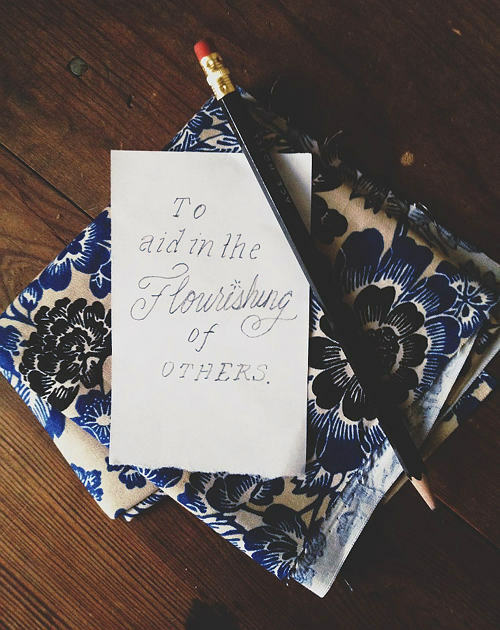 I want to aid in the flourishing of others and not be a stumbling block. Maybe if I am occupied with aiding in the flourishing of others, I will have less time to focus on myself and my struggles. Maybe if I am occupied with aiding in the flourishing of others, I will then be less overwhelmed and fearful and lost. Then in the midst of confusion I will find peace because in the midst of confusion I will see the Lord.